Best Arch Supports For Flat Feet: Top 5 Picks! 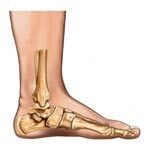 Flat feet are a common occurrence, particularly in adults who experience the loss of arches often after years and years of neglect to the important muscles in the foot that are responsible for keeping the arch in tip top shape. Having flat feet is not an uncommon condition and for many people, it poses little to no discomfort or issue. However, for others, the misalignment of the body that can result as a consequence of pancake feet can cause pain and make wearing certain types of footwear unbearable. Flat feet can be a result of several causes, however the most frequent is simply lost muscle tone that can stem from day after day of feet that a squished and shoved into shoes that don’t allow for fluid and natural movement and can result in a loss of muscle tone. Surgery For Flat Feet – When Is It Required? Scheduling surgery for flat feet should come as a last resort. Persons that have flat feet have an abnormally low arch. 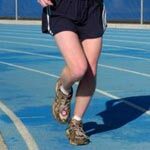 They may have footwear limitations and have difficulty while running, but there are rarely other complications. The most common flat feet treatment consists of a pair of orthopedic shoes or special shoe inserts. Unless you cannot walk normally, or experience extreme pain in the feet, you probably won’t need surgery for flat feet. The main symptoms of flat feet in children are pain and difficulty wearing shoes. However, the vast majority of kids who have flat feet show no symptoms at all. This is because arches are not developed until after the age of three. 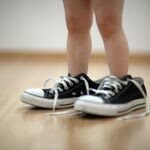 There are ways to deal with flat feet pain, but these treatments should only be pursued if your child’s pediatrician has expressed concern. When considering taking up flat feet running, participants have to make a major choice. 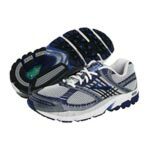 There are many types of sneakers and insoles that will help to make your stride steadier, but you may still not feel completely comfortable. Running barefoot also has many drawbacks and advantages. Although your final decision will be made according to your personal tastes, it is still important that you learn all of the facts first. 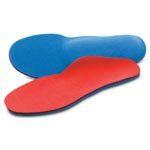 Ultimately, the best flat feet insoles are sold by orthopedic specialty stores. The types of insoles that you would find at a drugstore may help to give you some support, but it really depends on the exact depth of your foot arches. The quality and versatility of orthopedic shoe inserts for flat feet run the gamut, from providing barely any support to being amongst those given the highest marks by consumers.